Over the next few weeks you’ll be hearing about specific plans from the presidents of your individual entities (our five hospitals, the medical group and Community HealthLink) to get our finances back on track. Patrick Muldoon, our Medical Center president, began this process last week with a note to the Medical Center caregivers. Caregivers (we are ALL caregivers) at our other entities will hear directly from their presidents about specific changes they are also making. Please know, your leaders are working hard to make some very tough but necessary decisions and we will keep you informed as these decisions are made. At the system level, we are working to decentralize decision making by stripping away the layers of committees that often exist here and empowering our entity presidents to make and execute decisions quickly at the local level. Health care is changing rapidly in Massachusetts and we will have to move just as fast or risk being left behind. At the core of every decision we make are our patients and our people and we will do everything we can to protect both during this challenging time. You also play an important role in this process. We have established mandatory rounding for all executives at UMass Memorial and I need your help in making this program work. The goal of this program is to shorten the distance between management and the frontline staff that do the value-added work for UMass Memorial. When you encounter an executive in your area please introduce yourself and be candid with them about how things are going and the problems you face on a daily basis. This will help them make better decisions in their leadership roles. Many thanks to the caregivers who invited me to round in Central Scheduling. I will see you soon. Thank you to Dr. David Ayers who rounded with me at the Medical Center’s Memorial Campus on Friday. I was amazed to see a patient two days after a total hip replacement up and taking steps with no pain. I also loved seeing the new idea board in the operating rooms at Memorial; great job everyone! If you would like me or one of the other executives to come visit your area, please send us a note. One issue that we hear about during rounding is the trouble getting an appointment with some of our specialists. 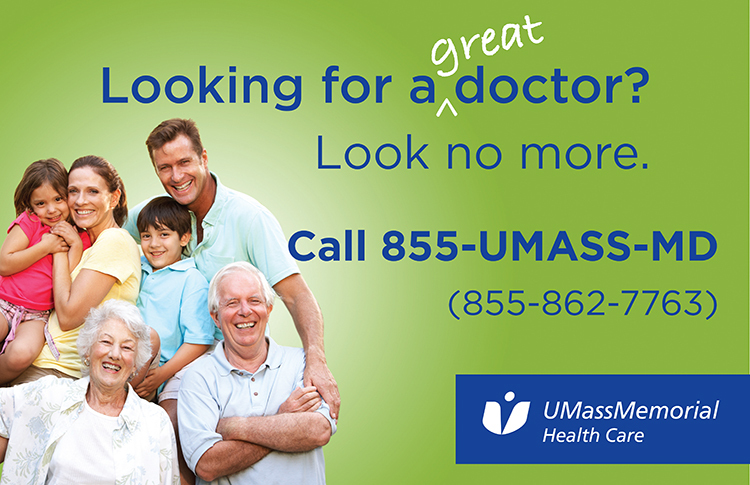 In July we took a big step in fixing that issue with the launch of our 855-UMASS-MD phone number. This number provides a seamless one-stop way of connecting primary care physicians, specialists, offices, and clinics to each other for referrals or directly with patients looking for an appointment. Previously, the onus for making a successful referral was entirely put on the referring doctor. This new number lifts that responsibility from the referrer, and puts it on us, where it belongs. In addition to this single line access, we’ve set the goal of providing same or next day access to all our patients that request it at the Medical Center. All of our physicians, employed or private, will benefit from this service, as so will our patients. 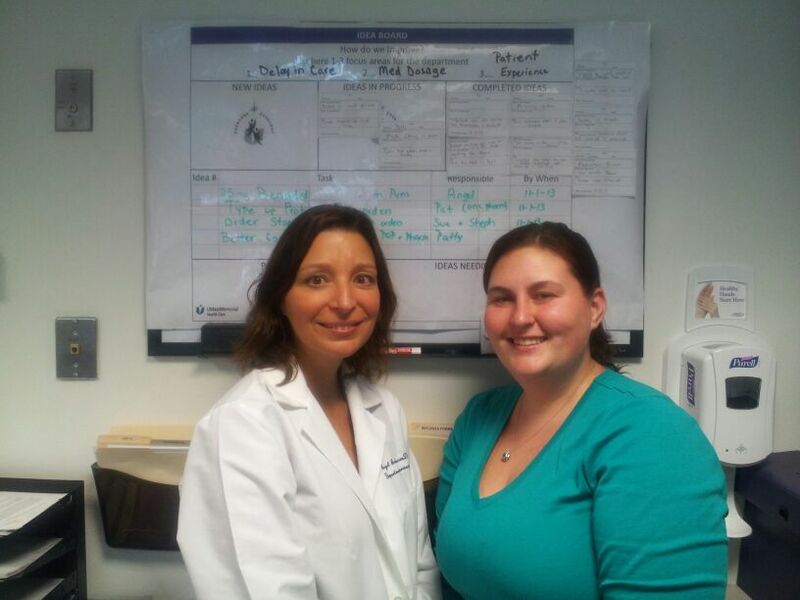 Angel Amaral, PharmD, and Stephanie Sciaraffa at the Medical Center Memorial Campus Outpatient North Idea Board. Your ideas are helping, and it is clear to me that the idea boards are working. For example, the idea board for the Outpatient North clinics on the Memorial Campus at the Medical Center has turned out more than a dozen ideas that have made a positive impact on patient and employee satisfaction. According to Jonna Dube, RN, the clinic’s manager, the whole team is focused on making positive change, but Ambulatory Services Representative Stephanie Sciaraffa has been the idea board champion. Recently, Stephanie involved Angel Amaral, PharmD, supervisor of operations at the Memorial Campus pharmacy, in the clinic’s idea huddles in order to solve a problem. With the two departments working together, they made a simple fix to preload Pyxis (the drug distribution system) with the three most commonly used pre-infusion medications, taking away a complete step from the old process. As a result, the time to get each patient infusion started has significantly decreased, reducing the time patients must wait between 10 and 35 minutes. This is bound to be a patient satisfier…excellent work!